One of the real keys to running a successful business or enterprise of any kind is maintaining a high level of organization. The best way to do that is to have the proper forms and documentation your organization needs to keep everything in order. At Jenkins Business Forms, we offer extremely affordable prices on a wide library of business forms and advertising aids. From all of the necessary forms for contractors to a deep selection of forms for specialty businesses, you'll find everything you need right here in one place. Our collection of Campground Forms features all of the most-used forms in the camping and outdoor recreation industries. Printed on strong stock for field usage, these forms are crisp, clear and meticulously organized. 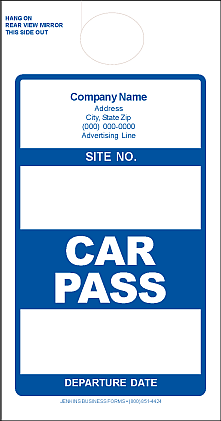 Choose from high-visibility car passes to visitor passes, registrations, rental agreements and more. Just click on the forms you need below to order. It's your business, so take care of it with inexpensive camping forms from Jenkins Business Forms.